Good afternoon! I hope you all had a nice weekend! 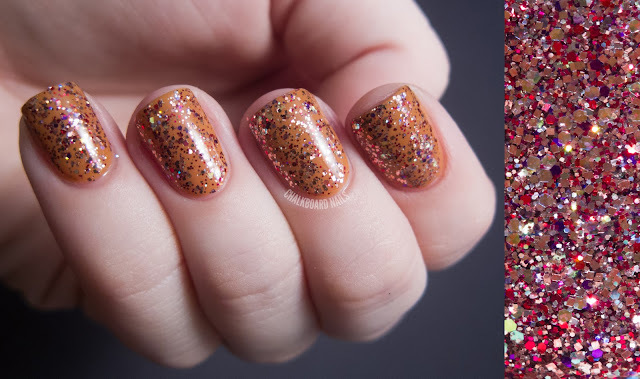 Today's second post is another set of Shimmer Polish swatches. As with the past two, I've included a swatch and a macro. Please remember to click to enlarge, and once you reach the end of the post, you will be rewarded with a discount code! Cristina is a tealy mix sprinkled with red. This is just one coat shown over Essence Thelma. I really like this one, I love the overall "smallness" of the pieces and the colors are just so pretty. Jasmine is an aqua-teal, blue, and green mix. It definitely reminds me of the famous Princess Jasmine outfit from Aladdin! I've shown it here over Nicole by OPI My Lifesaver. 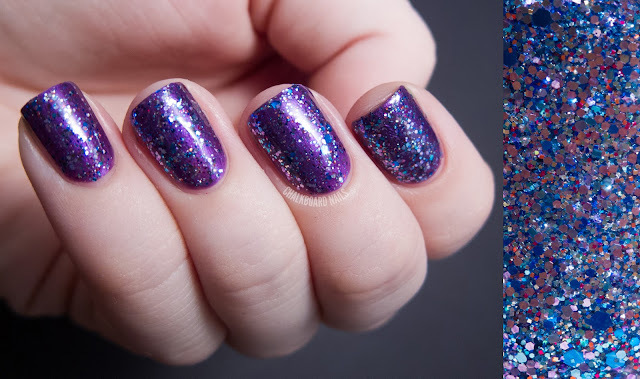 Leslie, shown here over China Glaze Coconut Kiss, is primarily lavenders and blues. Lorene is a rich raspberry shade. 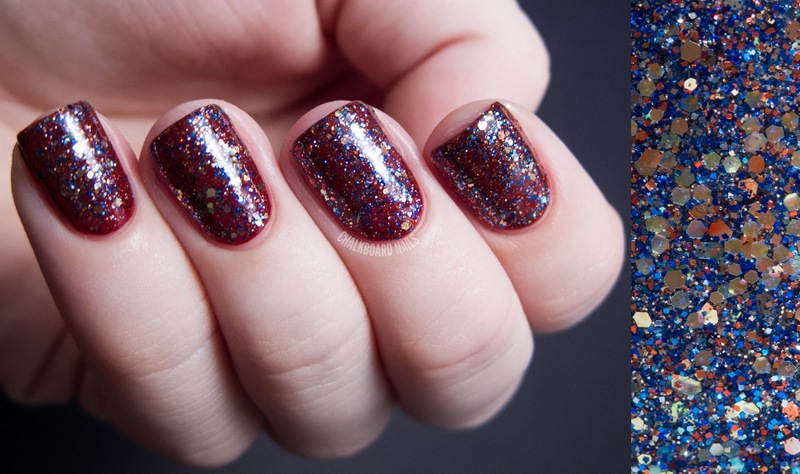 While layering it over OPI Germanicure By OPI maybe wasn't the most informative base choice, I love the way that these two combined. They made a very sultry, velvety finished look. 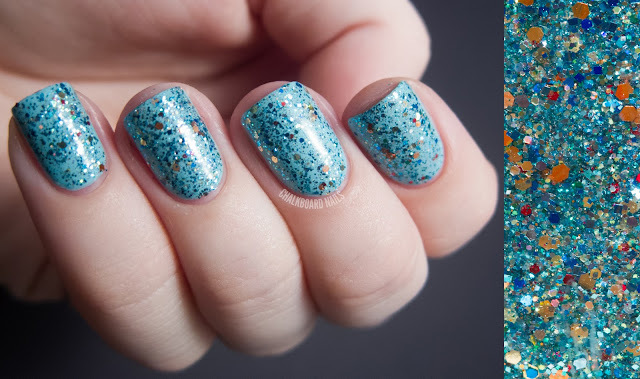 Natalie is a bold mix of blues, coppers, and interesting iridescent pieces. Shown here over Zoya Cola. 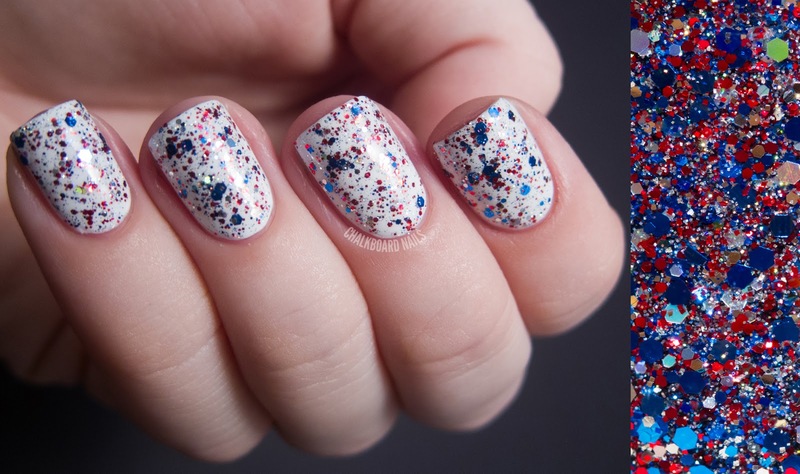 Nichole is a glittery polish that makes me think of the Fourth of July! It's a mix of red, blue, and silver and I've shown it over white here. The green glitter piece in the macro is just an odd reflection on one of the silver pieces -- no green is included in this polish. Sophie is a dusty pink blend with bits of purple. I've layered it over China Glaze Desert Sun. Strength, shown here over China Glaze First Mate, is an icy blue-teal glitter mix with silvers and silver hearts. Sales of this polish support PCOS organizations. As with the other Shimmers I've tried, the formula on these is fantastic. 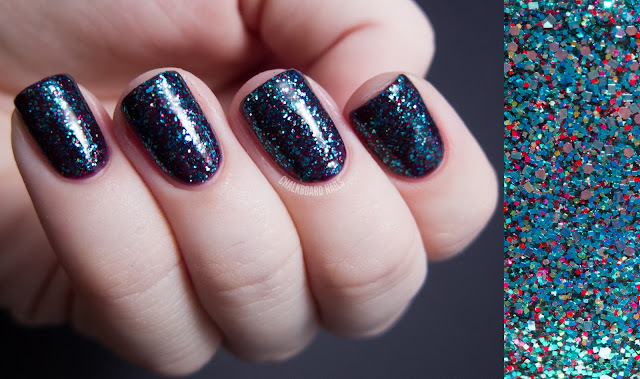 All swatches show just one coat of glitter, and they could easily be built up to opacity at two or three coats. The glitter glides on smoothly, doesn't catch on itself, and isn't thick at all. If you want more photos of these polishes, be sure to check out the listings in the Shimmer shop. There are a lot of lovely photos that will help you to paint a complete picture! Chalkboard Nails readers can receive 15% off through this Friday! If you are shopping on Etsy, enter the code "CHALKBOARD" at checkout. 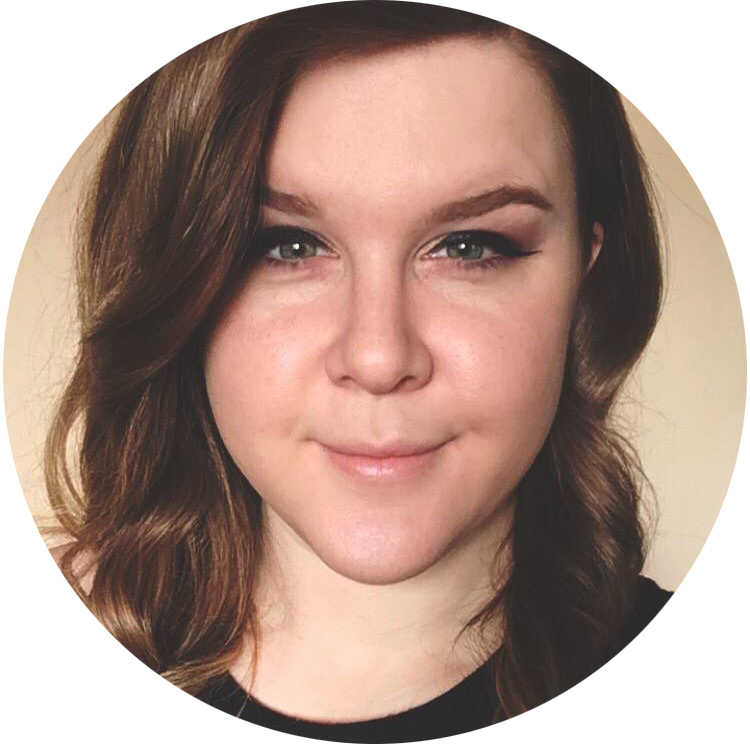 If you are shopping through the Shimmer website, just mention the code in your email. 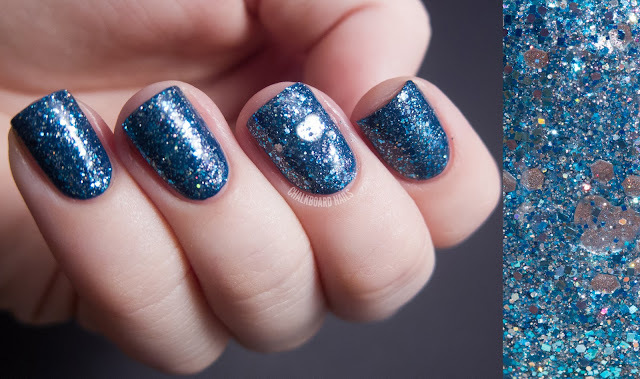 You can also find Shimmer Polish on Facebook. These are cute! Perfect swatches as usual! They are so gorgeous! Lorene is my favorite! These are all absolutely gorgeous! It is so beautiful i just cant choose one! Hmmm, I would have to say that Cristina is my fave of the Shimmers but I L-O-V-E the combo you did with Lorene!! !